Starting Friday, September 28, we are kicking off your weekend with live music by Alex Gordez, beginning at 7 p.m. Enjoy your Friday night with jazz/flamenco music, Spanish guitar, delicious Italian fare, and beverages. No cover charge! 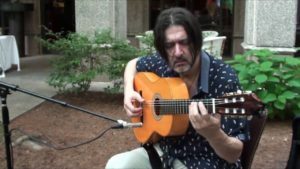 Alex Gordez is a guitar player, composer, and music teacher, specializing in classical, flamenco, jazz and world music, with over 30 years of experience in music education, theater, live performance, and studio environments. He played countless festivals and venues across the country and around the world. Alex’s music style combines contemporary Argentinean tangos, modern jazz, Brazilian music, and flamenco, incorporating his Jewish roots and his favorite Romany (Gypsy) styles. Alex started playing classical guitar at the age of eleven and graduated from Glier Music College in Kiev, Ukraine, as a jazz performer (guitar), arranger and composer. In 1988, he debuted at the International Jazz Festival in Ukraine and then started touring, performing jazz and world music. At this time, he started thinking about how to infuse world music with a jazz vocabulary. In 1991 Alex moved to Israel, and became a part of the Gesher Theater Company where he explored the theatrical application of his original works. Four years later, Alex moved to the United States and currently lives in Raleigh, North Carolina with his family. His latest project “Alex and Mutual Friends,” features Alex as a bandleader and composer, performing modern jazz/flamenco fusion originals, further pushing the boundaries of classical guitar. His new CD, “Notes From the Road” was released in 2016 and has been selected as the BEST CD of the Year in the Indie Acoustic Project’s ” BesT CD od 2016″ Awards in Acoustic Jazz category. Learn more at AlexGordez.com.